FIRST LOOK: I had a chance to play with a pre-production model of Fusion Garage's JooJoo Web tablet, which has been covered in controversy over the last week or so. Enough with the drama--let's see how the thing works. First, the specs. Fusion Garage CEO Chandrasekar Rathakrishnan was loathe to talk specs, insisting that to do so would draw comparisons to netbooks and the PC market (which is spec-obsessed) rather than an appliance like an iPhone or a Kindle, where processor speed is less of a concern compared to the quality of the overall Web browsing experience. That said: it has a 12-inch capacitive touchscreen display with a 1366 by 768 pixel resolution, 1GB of memory, a 4GB SSD (which is mostly used to store the OS and cache data, the user can't directly save files), and the processor is reported to be a 1.6GHz Atom with some kind of graphics chip assisting with HD video decoding. It also has one USB 2.0 port, Bluetooth support, a headphone and mic ports, built-in speakers, and a webcam with a mic. Internet connectivity comes from Wi-Fi and Wi-Fi only--no 3G Internet here. Interestingly enough, the JooJoo preview model we used had an expansion slot, but they're going to block it up before it hits the market. The JooJoo's form factor is sleek but not mind-blowing. It is light (about 2.4lbs) and fairly svelte (less than one inch thick), so it's not hard to hold one-handed or carry around, but it also isn't light enough or thin enough to be a tremendous selling point, either. It would fit perfectly in a backpack, suitcase, messenger bag, or even a large purse, and it's lighter than the average laptop or netbook. Fusion Garage claims that the JooJoo's battery lasts for five hours of uninterrupted use, and the device includes power management options to optimize battery use. 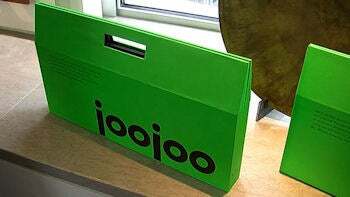 It charges via an included power brick that's smaller than most laptop power bricks and can readily fit with the JooJoo in a typical briefcase or laptop bag. Like any touchscreen device, the JooJoo keeps fingerprints like Homeland Security, and it only comes in black, so fingerprints and oil marks are more likely to show. Bring a cloth to wipe it down. Frankly, the software is going to make or break the JooJoo, and Chandrasekar was quick to remind us that the models we were using were nothing near ready for commercial release. Upon pressing the On button, the JooJoo boots in around nine seconds to the home screen, which has a series of icons linking to different Web sites categorized under "reach out" (Twitter, Facebook, MySpace), "have fun" (IMDB, YouTube, Hulu), "be informed" (New York Times, CNN), and so on, as well as the date and time, a URL/search box in the upper left, and the settings tab in the lower left. Users navigate the JooJoo by dragging a finger to scroll the display, tapping once to select a link or icon, and using the "pinch" and "zoom" gestures (familiar to anyone with an iPhone) to return to the home screen or go back to the browser. This is where the JooJoo needs to make the most improvement between now and the shipping date; both myself as well as PC World Senior Editor Robert Strohmeyer had trouble using the touchscreen gestures to consistently navigate, switch tabs, or scroll. That said, Fusion Garage also had an even earlier pre-release JooJoo model available with a different touchscreen that wasn't nearly as usable as the current model, so if they can keep on improving at this rate these issues should be scarce by the ship date. When you need to input text, the JooJoo brings up an onscreen keyboard layout. It's fairly roomy and easy to type, but don't expect the accuracy of a hardware keyboard or the assistance of a smartphone-esque auto-complete. Don't expect to do much typing other than the occasional tweet on the JooJoo and you'll be fine. If you're determined to buckle down and blog, the JooJoo does support a keyboard and mouse on the USB 2.0 port, so you could simply leave it where you work. The browser itself is a WebKit browser (the same rendering engine that powers Apple's Safari and Google Chrome, among others) so it had no trouble rendering Web pages, and it includes support for Microsoft Silverlight, Adobe Flash, and Java, so you won't be short on Web applications here. Underneath the browser is a stripped-down Ubuntu build that is essentially optimized to load the most basic drivers it can and boot up as quickly as possible. The JooJoo's accelerometer will also rotate the image when you rotate the display, if you're reading a blog or RSS feed that requires lots of scrolling, though this also took us a little doing. This is where the 12-inch widescreen dimensions get a little bit unusual; since it's almost twice as wide as it is long, it can get a little bit awkward with Web sites designed for a 4:3 aspect ratio. Note that the absolutely hideous colored backdrop present in all these photos is a user-definable feature, so your JooJoo doesn't have to look like an oversized green-scale Nintendo Game Boy. If you're the kind of person who keeps a laptop or netbook around the house or office and uses it mostly for consuming Web media (that is, not so much typing), you're exactly who the JooJoo is aiming for--it's a neat, lightweight device that has potential to do Web browsing well, and if your work is in Web apps then you'll be able to work from the JooJoo with just a keyboard and mouse. Don't expect it to replace any of your PCs, per se--it just might be nicer to use in certain situations where you're currently using a PC, like when you're catching up on the day's news or nosing through Hulu. 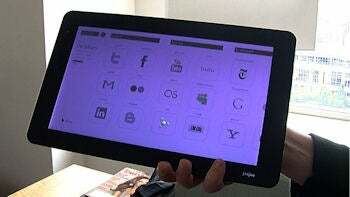 Ultimately, the JooJoo is more like a litmus test for tablets: if you're tempted by a $500 device designed for Web browsing, you should check out the JooJoo. The challenge will be for Fusion Garage to deliver a product that will not only carve out and establish the tablet market space, but also be able to hold on to it in case long-rumored tablets from Apple or Microsoft come calling.